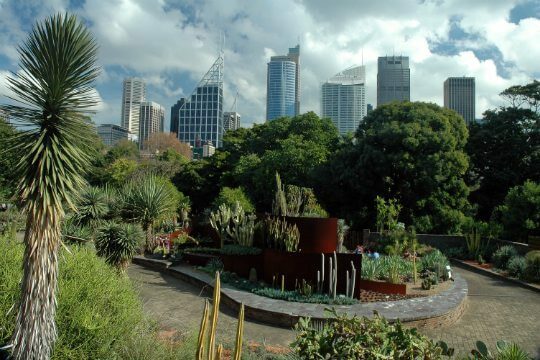 Just a stone’s throw away from the Sydney Opera House are the Royal Botanical Gardens. They are situated at Farm Cove overlooking the harbour and are a must for anyone exploring the city. The Royal Botanical Garden is a stunning oasis for tourists alike, but also frequented by horticulturalists wanting to learn more about the science behind the stunning scenery. The area was originally inhabited by the Aboriginal Cadigal people who would often perform ceremonial dances and initiations there. The area the Gardens are built on became the Governor’s residence. The Gardens were the location of the first every government-run farm in New South Wales. You will find things such as Mrs Macquarie’s Chair, where she allegedly liked to take in the views of the harbour. The architecture found within the Gardens also ties in with some of the more classical buildings to be found in Sydney from the Macquarie era. The Botanical Gardens were originally built and populated to bring a taste of England and Europe to the other side of the world. As the years have tumbled by, the gardens now focuses on growing and conserving native Australian trees, flora and fauna. It is the second oldest botanical site in the world and has been open since 1816. The Royal Botanical Gardens are completely free to enter! With over seventeen themed gardens and beautiful views of the city and harbour, it’s a no-brainer! How big are the Gardens? The Royal Botanical Gardens stand at a respectable 29 hectares, surrounded by 51 hectares of parkland. What purpose do the Gardens serve? The Sydney Botanical Gardens are really important to how we understand wildlife and plants. The Daniel Solander library is the largest botanical research library in Australia. Their herbarium contains 1.4 million plant specimens. They also run conservation projects, including that of the Wollemi Pine: an ancient tree species that was only discovered in 1994! The Botanical gardens sit right next to the Sydney Opera House. Circular Quay, Sydney’s main transport station, is the best way to get there via train, bus, boat or ferry. There are also some other wharves if you’re approaching from the east. If you’re spending a day at the Royal Botanical Gardens, there’s plenty to keep you entertained during the day with seventeen themed gardens, eateries, a music venue and an open-air cinema in the grounds. Finished soaking up the beauty of the Gardens? You’re right in the centre of Sydney so you won’t have to go far in any direction to find something to do. The world-famous Opera House is a short amble away. There’s also the Sydney Observatory, a multitude of museums and art galleries and the Sydney Tower Eye very nearby. Not to mention all the shops, bars and restaurants of the CBD.